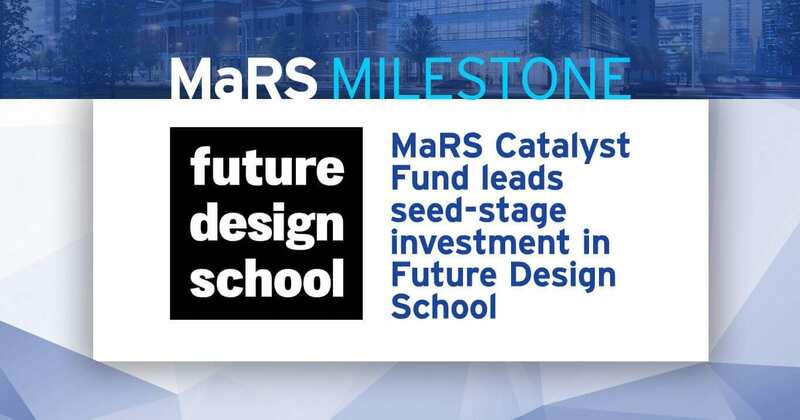 Today Future Design School, which teaches creativity, innovation and design thinking to current and future business leaders, announced it closed a seed-stage financing round with MaRS Catalyst Fund as the lead investor. Founded in 2015 by Canadian entrepreneur Sarah Prevette, Toronto-based Future Design School provides immersive educational programs for students, teachers and business professionals that aim to foster innovation and entrepreneurship. Future Design School is the first business to receive investment from MaRS Catalyst Fund, which is backed by Sir Richard Branson’s foundation, Virgin Unite, and invests only in early-stage businesses that are helping drive social progress. Future Design School provides world-class education programs that empower creative leadership and innovation in students, teachers and professionals. Through inspiring learning experiences, FDS programs help participants build the skillsets necessary to create meaningful solutions to pressing problems. MaRS Catalyst, a $5-million fund, was founded with $1-million in catalytic first-loss capital from Virgin Unite. It is based at MaRS Discovery District and provides funding and support to early-stage Canadian companies building scalable solutions to big social and environmental challenges, from work and education to health and sustainability. Other investors in the financing round include entrepreneurs Ido Leffler (Yes to Carrots), Satish Kanwar (Shopify) as well as education thought-leader Jim Lobdell (REACH Capital). “We’re thrilled to have partnered with investors who share our vision and are enthusiastic about our strategy for expanding our programming across North America. Participants in our programs develop incredible innovation skills and we’re looking forward to working in many more communities in 2017.” – Sarah Prevette, Founder and CEO, Future Design School. “FDS has a strong business model and we see high growth potential in the company. It also takes its social mission very seriously, empowering young people with an entrepreneurial mindset that will ultimately help solve significant social problems and create meaningful employment.” – Kathryn Wortsman, Fund Manager, MaRS Catalyst Fund.